Looking for a USED WF67Y-500T/9000? ANHUI SANLI MACHINE TOOL MANUFACTURING CO.,LTD founded in Aug 1998. In past years, we are passionate about providing engineering excellence in everything we do, and we are dedicated to manufacturing world class, high-quality products for our global customers. SANLI is ISO9001: 2008 certified, and products meet the CE safety requirements and regulations. With a highly dedicated team, SANLI offer you an extensive machine tools specializing in cutting, punching, bending technologies and services. Our global sales network covers in Europe, Australia, North America, South east Asia, Mid-east, South Africa ect... SANLI mainly produces shears, press brakes, plate rolls, ironworkers, corner notchers, presses, blade and moulds dies with different specification plus complete sets of accessories used for motor vehicle industry, shipbuilding industry, railway, aviation, metallurgy, electric power, petrifaction, light industry, mine, decorate, construction, city planning for park. We use the latest control system to ensure highly efficient production, and the quality assurance team measures and tests each component to ensure precision standards of machined parts are met or surpassed. Finally, before delivery, each complete machine goes through intensive quality and performance tests to make absolute sure it meets our strict company quality standards before it arrives at the customer’s operation. Total customer satisfaction is the core of our work. SANLI group is working toward to deliver customer Durability, Accuracy, Versatility products. We look forward to your continued support and comments -- together we will push quality at SANLI ever higher. 65 ModelsView more about ANHUI SANLI MACHINE TOOL MANUFACTURING CO., LTD. 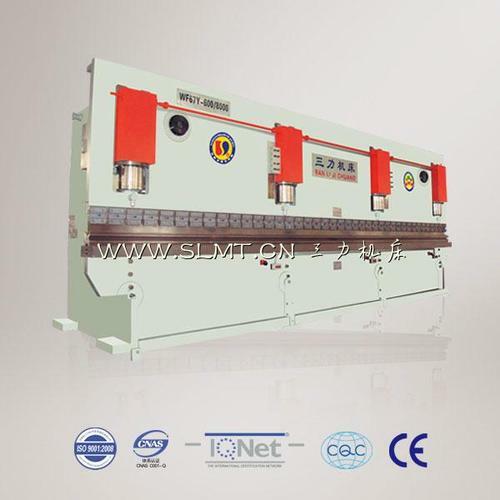 Looking to Purchase a New SANLI WF67Y-500T/9000?